Apple will put an end to the rumors and introduce its next iPhone on October 4--it's already sent out invitations to an iPhone-specific event that will be held at Apple's Cupertino campus. New Apple CEO Tim Cook is expected to take the stage and make the big announcement. Depending on which story you're reading, the next iPhone will either have a completely new design or be exactly the same, aesthetically, as the iPhone 4. In other words, Apple has managed to keep the tech press guessing. But considering that Apple has gone 16 months without announcing a new iPhone, I would be surprised if the iPhone 5's design offers nothing new. The iPhone 4 had a new design, but it didn't surprise us with its specs--it received the same A4 chip as the iPad. Following the same lines, I think the next iPhone will have the same dual-core A5 chip that debuted in the iPad 2. I think we can probably look forward to a new camera--not only do rumors suggest that the next iPhone will have an 8MP camera, but Apple has a history of improving the iPhone's camera with each generation. To go with the new chip and camera, the next iPhone will also probably have 1GB of RAM--but Apple probably won't say much about this. After all, Apple doesn't usually spend a lot of time discussing specs. Rumor has it that the next iPhone will have software improvements, including expanded voice commands. The new voice commands--part of a feature reportedly called Assistant--are based on Siri, the virtual assistant software maker that Apple acquired last year. This system-wide voice navigation system could be a standout feature that's exclusive to the iPhone 5, and a big focus at next Tuesday's event. Apple did make voice commands exclusive to the iPhone 3GS in 2009, so requiring an iPhone 5 for expanded voice commands isn't without precedent. Bonus prediction: The event invitation includes a photo of the iPhone's maps application icon, which has me wondering if Apple will finally add turn-by-turn directions. 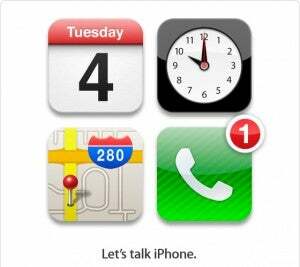 The use of the singular in the invitation ("Let's talk iPhone") has led pundits such as John Gruber to speculate that Apple will only launch one new iPhone, despite rumors to the contrary. While Apple may not launch an iPhone 4S, it will still drop the price on its old iPhones--AT&T and Verizon iPhone 4's--as it has in the past. Low-cost, older-generation iPhones have proven to be very successful, and are one of the reasons AT&T far outpaced Verizon in sales in the second quarter, despite Verizon having the iPhone 4. I doubt Apple will give up that market. Between the Wall Street Journal's unnamed sources, Bloomberg's unnamed sources, and Sprint's internal memos telling employees to keep quiet, a Sprint iPhone 5 seems like a good bet. T-Mobile, on the other hand, probably won't be part of Apple's announcement. When asked if T-Mobile would be getting the next iPhone, T-Mobile CEO Cole Brodman recently said, "To my knowledge, not in October."